Limited time offer for Australian Residents – 4 Day Disneyland Resort Park Hopper Ticket for the price of 2! There’s magic for days at the Disneyland Resort! With its two amazing Theme Parks, three Resort Hotels and the Downtown Disney District, the world-famous Disneyland Resort is where Guests of all ages can discover wonder, joy and excitement. Disneyland Park is home to new and classic attractions and entertainment – like Star Wars™ Launch Bay, Pirates of the Caribbean and Splash Mountain. Disney California Adventure Park is where you can go Soarin’ Around the World and enjoy incredible entertainment like Frozen – Live at the Hyperion theatrical spectacular. Plus don’t miss Pixar Fest, the biggest celebration of stories and characters from Pixar Animation Studios ever to come to Disney Parks, beginning 13 April 2018, at the Disneyland Resort in California. There are so many can’t-miss attractions, shows and experiences waiting for you to enjoy. The memories you’ll make are nearly limitless. So gather your family and friends and come to the place where dreams come true! Australia and New Zealand Residents can purchase a 4-Day Disneyland Resort Park Hopper Ticket at a 2-Day price for a limited time only. This is the perfect time to visit the Disneyland Resort! Book your 4-Day Disneyland Resort Ticket between 1/12/17 and 31/3/18 and pay for a 2-Day Disneyland Resort Ticket. Travel anytime between 1/12/17 and 31/12/18. That’s two days free to experience Guardians of the Galaxy – Mission: BREAKOUT! and help save the Guardians from the Collector’s Fortress at Disney California Adventure Park. Make magical memories on classic Disneyland Park attractions and welcome back Fantasmic! There is so much to see and do, but this limited time only offer ends on 31/3/18. Travel Periods: 7 January, 2018 – 24 May, 2018 (last day of check in). Travel must be completed by 25 May, 2018. "Some room category restrictions apply. 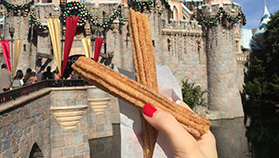 See specific hotel for details"
From giant candy canes to Dole Whip, find out what weird and wonderful things you’ll only find at Disneyland. The happiest place on Earth gets even better when you’re staying on site. 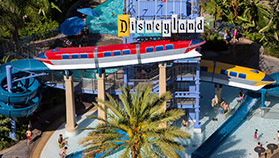 Purchase a 4-Day Disneyland Resort Park Hopper Ticket for $80.50* per person per day! 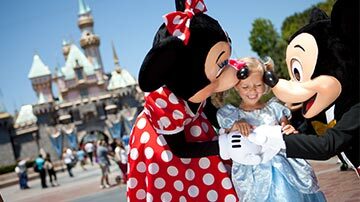 For only $80.50* per person per day you can experience Disneyland Resort Theme Parks. Discover Disney California Adventure Park, featuring the exciting Cars Land, and the one-and-only original Disneyland Park with its world-famous attractions and beloved Disney Characters. 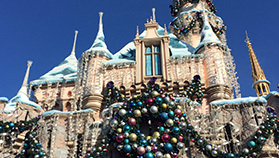 Now it's more magical than ever at the Disneyland Resort. *USD$244 for adult; USD$232 for child. Prices converted to AUD at exchange rate of 1AUD = 0.76USD using xe.com at 11:30am AEDT on 30.11.17. AUD prices subject to change based on exchange rate fluctuations. In Disneyland Park, stroll down Main Street, U.S.A., where Walt Disney’s original vision still captures your heart and transports you to faraway places you could only dream about. Embrace world-famous classics like “it’s a small world,” the slicked icy slopes of the Matterhorn Bobsleds, and those beloved Disney Characters you’re never too old to hug. Then blast off into the Star Wars™ universe on over 50 possible 3-D adventures aboard Star Tours—The Adventures Continue. And rock your world with Mickey’s Soundsational Parade and thrilling fireworks that explode the night sky. Explore Disney California Adventure Park where Buena Vista Street welcomes you to the 1920s when inspired young filmmaker Walt Disney first arrived in Los Angeles. Now get ready to rev your engines because that’s the town of Radiator Springs you see rising up on the horizon. You’ll be floored in the 12-acre Cars Land where the Disney•Pixar’s hit movie Cars comes to life with high-octane attractions, dining and shopping. It’s a one-of-a-kind Disney experience! And there’s much more to discover in eight themed lands including The Little Mermaid~Ariel’s Undersea Adventure and World of Color nighttime water spectacular. The Twilight Zone is a registered trademark of CBS, Inc. and is used with permission pursuant to a licensing agreement from CBS, Inc.
Stroll along a lively promenade featuring distinctive dining, unique shopping and exciting nighttime entertainment. Eat at a rainforest temple overrun with exotic animals, watch the big game from inside an ESPN broadcast studio, catch a live performance by the latest musical sensation and discover wonderful new surprises around every corner! Get away for a few hours and spend some quality time in an immersive Disney environment—all without an admission fee. And if you live in Southern California, it's all right next door. Make the most of your trip to Southern California: Save up to 25% on admission to top attractions! It's the best deal around. Buy your CityPass before you go to save on admission to all your favorites, including 3 days at Disneyland Park and Disney California Adventure Park, plus much more. Frozen – Live at the Hyperion, a theatrical spectacular! 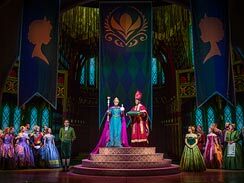 Frozen—Live at the Hyperion in Disney California Adventure Park brings to life the timeless story of Anna, Elsa, Kristoff, Sven and everyone's favorite snowman, Olaf, in a spectacular musical stage production. It's an incredible, unforgettable theatrical experience that will delight your entire family. 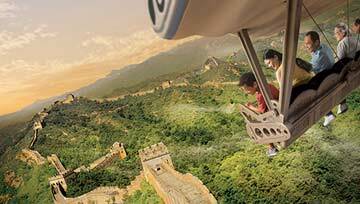 Fly through the sky like never before as you hang glide over international landmarks and beloved landscapes. It’s Soarin’ Around the World, an epic re-imagining of the classic Disney California Adventure Park attraction! Start by visiting the Swiss Alps, then on to The Great Pyramids of Eqypt, sail across Sydney Harbour, fly over the Great Wall of China and explore so much more. Come help rescue a cosmic gang of misfits in Disneyland’s new Marvel attraction - Guardians of the Galaxy – Mission: BREAKOUT! This thrilling attraction is fueled with high-energy, hilarious action that will be fun for Super Hero fans of all ages. 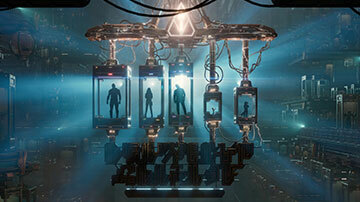 The new attraction entices guests with an original storyline based on “Guardians of the Galaxy” films, comics and animated television series, with a rapid rise into chaotic adventure and surprising visuals. The fast-paced action rocks to the beat of music inspired by the films’ soundtracks, including classic rock and pop music from the ‘60s, ‘70s and early ‘80s. And with multiple ride profiles, guests never know which adventure they’ll get. Disney FASTPASS Service can save you time waiting in line at some of the most popular attractions within the Disney Theme Parks. This service is included with your theme park admission. Service is available on some entertainment options like, Frozen – Live at the Hyperion and World of Color. Some of these offerings can change without notice. Disney PhotoPass Service: Disney PhotoPass Service lets you capture your magical vacation memories in great photos—and get everyone in the shot! 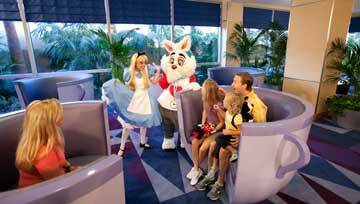 Just look for our Photographers around many of the most famous Disney icons, at most Disney Character Experiences, and even special dining locations. Want a little extra pixie dust in your photo? Our Magic Shots let you pose in a special moment with animated characters like Tinkerbell, Mickey or Olaf. Viewing your memories is easy too. You can create an account online or in the Disneyland Resort mobile app and view your photos almost instantly. Disney MaxPass Service: When you add the Disney MaxPass feature to your ticket, you’ll be able to download, save and share all of your Disney PhotoPass photos captured during an entire day. Plus, you’ll have the opportunity to reserve digital Disney FASTPASS selections right from your mobile device using the Disneyland app while you’re in the parks. Enjoy both services for the introductory price of only USD $10 per ticket, per day! World of Color FASTPASS Ticket: Disneyland Resort Guests must receive a Disney’s FASTPASS ticket for any showing of World of Color. World of Color FASTPASS tickets can be obtained at the entrance of Grizzly River Run attraction inside Disney California Adventure Park. There is no additional cost for these tickets, but tickets are limited and are on a first-come-first-serve basis. Contact Disney Dining for additional information on Dining packages with preferred and premium viewing for World of Color. A great way to meet Disney Characters are at Disneyland Resort restaurants with Character Dining options. Disney Characters also appear near certain Disney Theme Park attractions or at Meet and Greet locations listed in the Park Guide Map. Guide Maps are available at the entrance of each Disney Theme Park.